Over the Christmas break I moved everything out of my office/study at the front of the house and moved everything from my gaming room at the back of the house, into the study. 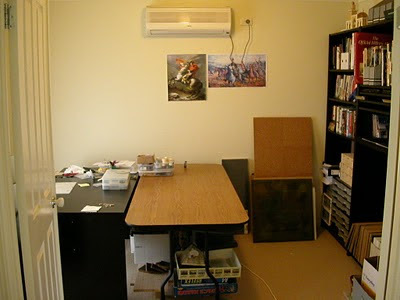 The old gaming room was a small spare bedroom. The study is actually a 4th bedroom with double doors right at the front of the house opposite the main lounge area. It is bigger and better lit and is where the air conditioner for the front of the house is situated. I already had a bookcase I got from Ikea set up so I purchased another and set that one up next to it. On this I placed all my books, categorised, and all my figures. I placed my old black desk at the front of the room about 1m from the window so I can use the light coming in from behind me as I paint or model. 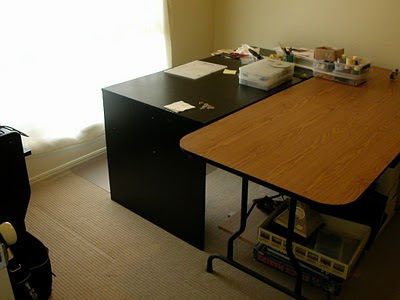 I placed my gaming table next to this desk in the middle of the room. Both desks are up against the wall. Under my gaming table I placed down my recently constructed floor flame which includes a shelf about 20cm off the floor so all my boxes of "bits" can be kept off the floor to aid vaccuming. At the moment I have all my table sections and terrain modules resting against the back wall but will eventually have a home for them. I plan to increase the shelving along the back wall where the current shelves are. I can fit another 80cm unit and a 40cm one from Ikea in the space. That should look pretty good. Looking right at the table modules and terrain modules resting against the back wall, the shelving and space on the right for more shelves at a later date. I found that 2 biscuit trays which contains each of my 6mm corps fits perfectly on 1 shelf. Close up of the tightly spaced shelves for trays of troops. Spare shelves can be purchased from Ikea so I got another 10 of them to eventually have all my troops stored this way. One of the biscuit trays with the 1st Corps of French for Waterloo. I am in the process of moving these from the smaller silver tray which is about A4 in size to the larger flatter black try which fits perfectly with another to take up 1 shelf in the shelving units. The custom built shelf that raises all my boxes and stuff off the floor. We have robotic vaccum cleaner that is about 20cm high so we simply throw him in and shut the door and he goes to work and has no trouble with clutter. Anyway, this is all very exciting for me and inspires me to better and greater things. It also encourages me to keep it all clean as visitors will most likely see it when they enter the house. Now I just need to invest in a few props and pictures to add and it will really have some Napoleonic flavour. That raised shelf is an excellent idea! 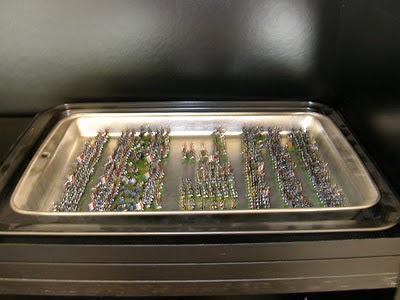 I like the use of trays to hold your corps, certainly one advantage of 6mm over 28s. It's a good space, but then I'm quite envious of anyone who doesn't have to make do with occasionally borrowing the dining table!